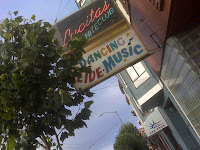 I passed 3300 Club and noticed that my next stop would be Lucita’s Niteclub which is about a block away. 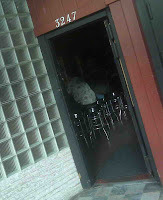 The brightly colored neon sign beckoned me to enter. The door flanked in glass was welcoming but I was soon put on guard. Reminiscent of Club Malibu, Lucita's design was cleaner and with a newer feel—the paint was fresh, the bar was clean and a pool table seemed to stand guard over the dance floor. As orderly as the feng shui appeared to be, it didn’t take long to notice that there was an ominous gloom that hung over this tidy, dark bar. Until now, my safety during Mission on Mission has not been a concern—even the guy sharpening the knife at the bar didn’t freak me out—but within a few steps of entering Lucita’s I encountered something that gave me pause. 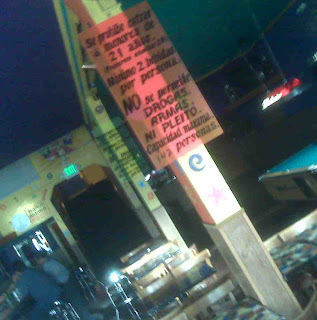 In black letters on pink Plexiglas the sign read: “No one under 21 allowed, minimum 2 drinks per person, NO drugs, firearms or fighting will be tolerated”. WHAT?! No firearms? Since when do you have to put a sign up saying this? In English AND Spanish no less. Parts of Mission Street can be shady but seriously… no firearms or fighting tolerated? This was serious stuff and I took the warning to heart. The bartender, Maria, was a 5-beer girl—meaning that after 5 beers she starts looking pretty good to the patrons. Part of her charm was her low cut top, super short black skirt and decent legs—thanks to nice high heels. Her low cut top seemed to do its job—distracting her clients from noticing the extra padding around her middle. The waitress also managed to garner plenty of attention even though she was an 8-drink girl—and one of those would be a strong shot of tequila... Her spandex shirt fought hard to keep her paunch under wraps but there were a few times when the shirt screamed uncle allowing her belly to breath. In this case, the TV over the end of the bar was the only available distraction but that didn’t stop her from getting some affection from the older gents at the end of the bar. Plenty of action here with the pool table and the dancing but the atmosphere was pretty much the same as Club Malibu. Thankfully there were no confrontations, firearms or drugs—so I consider this a successful stop on my Mission. 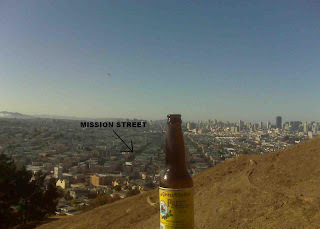 As the weekend wrapped up, I found myself on the top of Bernal Hill (just East of Mission Street overlooking much of San Francisco) enjoying a cold and refreshing Pacifico. Looking down over Mission Street I thought of the 10 bars I’d visited thus far and contemplated the many more yet to come such as The Knockout, El Rio and Roccapulco just to name a few. What have I gotten myself into? Three quarters of a mile into my journey, with 10 bars under my belt, I still have another 4 miles until I reach the Embarcadero. A long strange trip lies ahead.